This is the tale of an incredible response to massive storm damage. It is a case study in how to do things right following a disaster. The Valley of the Sun, the local name for the greater metro-Phoenix area, gets an average of just 28 days of rain per year and only 7 inches of annual rainfall. This compares to 100 days on average in the US and an average 37 inches of rain. So it was a totally unprepared region on October 5, 2010 that experienced a freakish hail storm that literally ripped a path across the most populated area of the state. The daytime temperatures had been in the 105-106 F degree range the days before. On October 5, 2013, the temperature dropped from the high 80s to the the 50s in seconds. A thirty degree drop in just seconds was followed by a further drop down to the 40s. I was personally stuck in the third and most frightening wave. The first two hail storms passed earlier in the day. Around 5 pm, coming back from a meeting. I was in a Honda S2000 two seat sports car convertible with a canvas top. The storm had seemed to pass when the sunlit day turned dark and hail the size of golf balls and softballs came crashing down. I was stuck on a highway on-ramp, surrounded by cars that started ramming each other in the suddenly icy road. I slid to a stop as it sounded like a mob hitting my car with baseball bats and shotgun blasts. I could not move to shelter as I was hemmed in by vehicles with a mini-van sliding to within inches of my driver door. The hail was coming from all directions. It hit my roof so hard that the hail was forcing the fabric down and hitting me inside. I had to lay across the passenger seat to get low enough not to be hit. I thought about fleeing the car but did not know if the hail could kill me if I left. I wondered what would happen if the roof ripped open or the glass started to shatter. It seemed like forever before the storm passed. In reality, the hail lasted about twenty minutes. My car had every piece of metal damage and all the glass cracked. I had over 800 dents in my car, including a hail stone that had broke through the reflector on my trunk lid, through the trunk, and shattered the wiring inside. My roof was shredded. When my car was repaired, every external metal panel, glass, roof and lamp had to be replaced. It cost around $25,000 to repair and took four months to get back. My car damage and repair time was nothing compared to the damage wreaked upon the vehicles and buildings across Phoenix and the surrounding cities. The storm had hailstones measured over 2 inches in diameter and caused $2.7 Billion in damage in less than an hour around 5 pm drive time for Phoenix commuters. 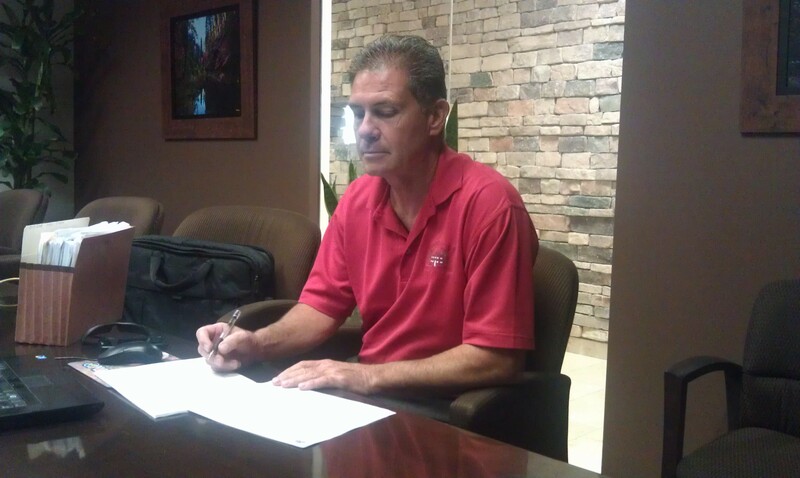 Scott McCleary, of the Valley Schools Insurance Trust (VSIT), was on the front lines. VSIT is a joint purchasing pool for liability insurance for three very large school districts; Peoria Unified School District (PUSD), Deer Valley Unified School District (DVUSD) and the Paradise Valley Unified School District (PVUSD). Together, the school districts have over 100 campuses and thousands of school buses and maintenance vehicles. In addition to the three hail storms in one day, buildings were suffering flooding from both rain and from leaking roofs. Scott McCleary arrived at the Pioneer Elementary School campus first in the Peoria Unified School District. Tom Bock put into action a plan of attack that would succeed where many others have still not repaired damage as the second anniversary of the storm approaches. 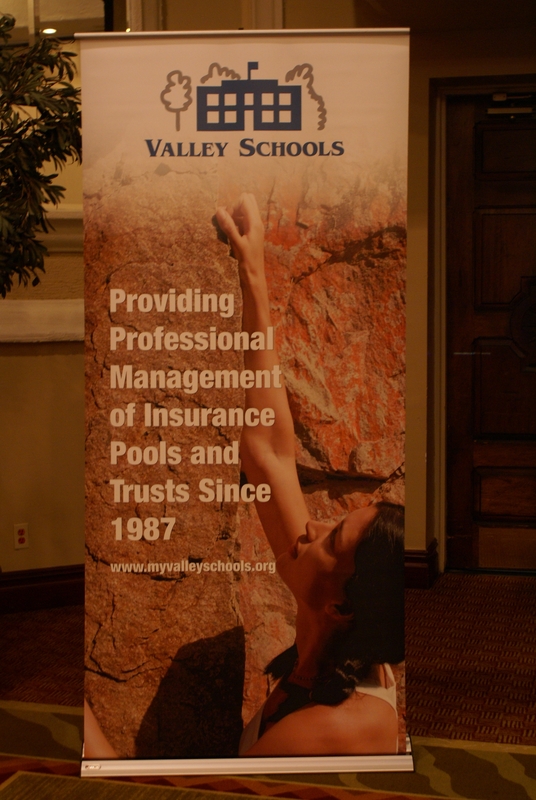 The school districts in VSIT pool their liability insurance and have a re-insurer for each incident starting at $100,000. The re-insurer for this storm was Travelers. Travelers was contacted immediately by VSIT and brought in. By the end of the first day, Scott and the on-site adjuster had walked, inspected and put into action mitigation at four campuses. Each campus has from several hundred to a few thousand students, hundreds of faculty, and multiple buildings. After the first day, the Travelers Catastrophic loss Team (CAT) was flown in from New York. Over the next two months, 115 campuses were full inspected and close to 100 have hail damage to roofs, rooftop air conditioning units, shade structures, windows, skylights, light structures, and paint. Amazingly, out of around 4,400 solar panels, just seven were damaged. The damage to the vehicle fleets were also dramatic. Tops of school buses were dented while some three hundred support and maintenance vehicles were badly damaged. For Scott McCleary who usually manages around 125 losses per year, he was now faced with managing losses at 100 sites, each with multiple buildings, vehicles and problems. Work started immediately on the most damaged sites, including Pioneer Elementary and the Sandra Day O’Connor High School, each of which had flooding damage. Thanks to the prompt action of VSIT, no school days were missed due to the hail damage at any of the 115 campuses. Critical to the team that would accomplish this and future storm inspections and repairs were Jeff Long, the Director of Facilities at the Deer Valley Unified School District and Jim Migliorino, the Assistant Superintendent of Business Services for DVUSD; Edward Gillam, the Director of Facilities for Peoria Unified School District and Michael Finn the Assistant Superintendent of Business Services for PUSD; and Cole Morris, the Director of Facilities for Paradise Valley Unified School District and Tom Elliott, the Assistant Superintendent of Business Services for PVUSD.